Technically, my writing that is not staying out of the discussion. So, for today’s post, I am going to let you hear from a woman. A Fool’s Inclination is happy to introduce to you Astrologer Juliet Morgan. Juliet has co-authored this post and is the reason for it. A major part of the Grand Sextiles in July and August is what in Astrology is called a Kite. It literally looks like a kite. You will notice that I included one additional aspect to this chart: namely the T-Square that Uranus forms with the Jupiter-Pluto opposition. Now compare it to this kite (right). Looks pretty similar, eh? Back in 1925, Saturn was in Scorpio and only ten degrees from where it is now; Jupiter and Pluto were in opposition then, but reversed; and Uranus sat in the upper-right corner where Neptune and Chiron are now. In 2013, Jupiter opposes Pluto only once. In 1925, Jupiter opposed Pluto three times. The average position of Uranus was 22 Pisces. The average position of Neptune was 23 Leo. And the average position of Chiron was 23 Aries. So on all three dates, the sun at or near 20 degrees made an aspect to all three. The kite of 1925 was strongest in October (from what I can tell). Jupiter, Pluto, and Saturn all occupied 14 degrees. All in all, the kite of 2013 is nearly the same kite on a different day. Some history may repeat. Some issues might be revisited. Some things started then, could possibly be completed now. I do agree with you that the current political debate over House Bill 1 is a perfect manifestation of the current transits. I noted this myself a few weeks ago. If you look back in history to the 1910s-1920s when women’s rights were also at the forefront of political debates, you will find an amazing coincidence! Particularly, look in 1925: Pluto was in Cancer and Jupiter was in Capricorn! And they formed a Kite! Saturn was even in Scorpio (as it is now). Instead of Neptune (and Chiron) in Pisces, it was Uranus! I did a bit of research on important dates for women’s suffrage and the Equal Rights Movement, etc. I don’t have exact dates, but I do know that several momentous accomplishments for women occurred in and around 1925: Nellie Tayloe Ross, the first US Woman Governor, was elected in Wyoming (1925), Edna St. Vincent Millay was the third woman to win a Pulitzer for poetry (1923), and Florence R. Sabin was the first woman to join the National Academy of Science (1924)! “Edna St. Vincent Millay  was an American lyrical poet and playwright. She received the Pulitzer Prize for Poetry in 1923, the third woman to win the award for poetry, and was also known for her feminist activism and her many love affairs. She used the pseudonym Nancy Boyd for her prose work. Margaret was born on October 13, 1925 – that is two days before the exact Jupiter-Pluto opposition! In February 1919, Congress voted on the 19th Amendment (Women’s right to vote) and it failed by ONE VOTE. At that time, Jupiter was conjunct Pluto in Cancer. In May, it finally passed in Congress and then in June it passed in the Senate. The 19th Amendment was added to the Constitution on August 18, 1920. Shortly thereafter, the Equal Rights Amendment was introduced to Congress; however, it was many decades later before it was passed. Finally, in 1921, Margaret Sanger founded the predecessor of Planned Parenthood in NYC. 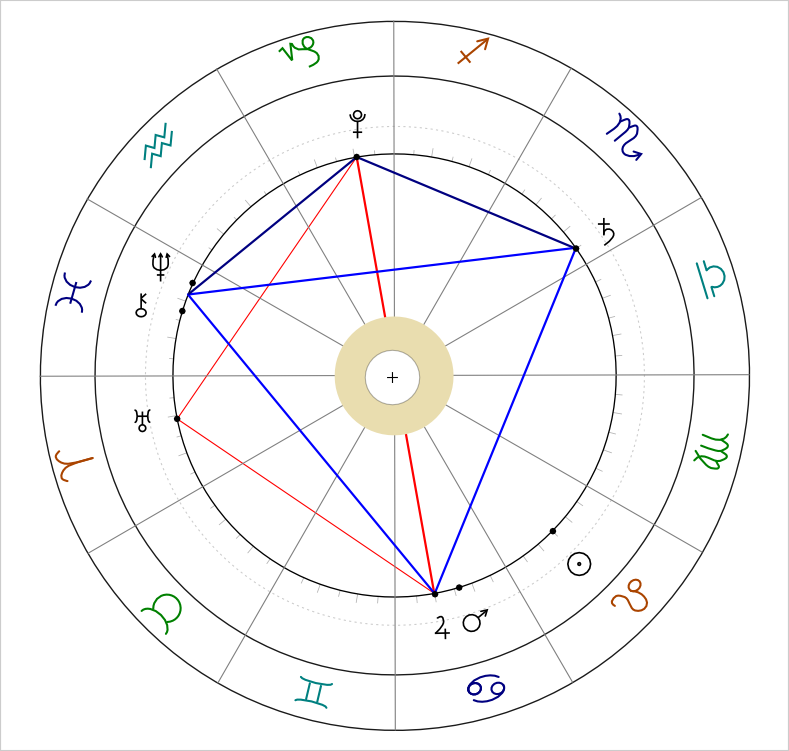 Incidentally, Richard Burton was born in November 1925 and has the above kite in his chart. 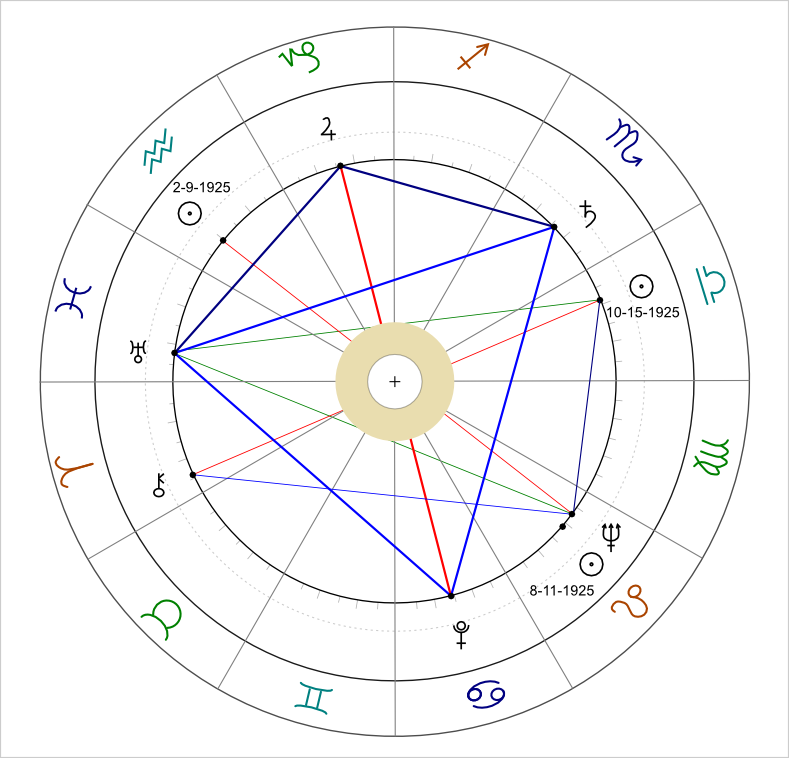 His relationship with one of the most iconic women of our time, Elizabeth Taylor, is evident in his chart (Jupiter opposed Pluto?). As you can see, the Kite of 1925 came and went throughout the entire year. Events occurred and people were born in and around that year. We may not know the half of what this year’s configuration will do for women’s rights, but we are seeing a lot of energy and action already! If you have additions historic facts to share, please add to the discussion by writing a comment below!